Much like happy hour and weekend brunch, 3M Half Marathon is always better with friends! Friends hold you accountable during your 3M Half Marathon training. They support you at the end of long runs when you’re feeling sluggish. Often times they lighten the mood when you just don’t want to run, making the miles pass. And they’re always there to celebrate your accomplishments. On race day, they cheer for you. They might pace you to your first half marathon. If they get ahead, they wait for you at the finish line. And they’re always the first to take a selfie with your new Downhill to Downtown medals and post it on social media. You might have folks that do this for you. Just remember: this is a two-way street. What your buddies do for you, you do just as much for them in return. That’s why you should train for and run 3M Half Marathon with friends! You put in months of training leading up to the 25th anniversary of the 3M Half Marathon. Hopefully, you’ve recovered by now! Many runners keep their training going, but they focus on shorter distances. Instead of more running, expand your endurance horizons when you try Rookie Triathlon. There are many benefits to not focusing on running and trying Rookie Triathlon. Some will make you a better runner! If you’ve never completed a triathlon, Rookie Triathlon is for you! With a 300m swim, 11.2-mile bike ride, and 2-mile run, this event is perfect for first-timers. The swim entry is very controlled, 1-2 participants enter the water every couple of seconds. This prevents clusters of swimmers in the water at one time, helping to calm Rookie nerves and provide a safer swim. Which then leads to more space for cyclists on the road during the bike portion. The field consists of veterans too, so if you need some last-minute advice you don’t have to go far. The repetitive motion of logging hundreds of miles can stress the body. Plus, if you only run, you’re using your muscles in one motion repeatedly. This can lead to overuse and possibly injury. Cross-training could prevent some of these issues, help you stay healthier, and make you a better runner. Swimming is excellent for two main reasons: 1) you’re using your entire body during the workout, and 2) you’re not pounding the pavement putting additional stress on your muscles, joints, and ligaments. Cycling will help you build lower body strength while working your joints and muscles differently. Both of these activities can build your overall strength, help you lose weight (if needed), increase your lung capacity, and prevent injury from overuse. That’s right, Rookie Triathlon will celebrate their Sweet 16 on Sunday, May 5th! This isn’t some fly-by-night triathlon, Rookie Tri is owned and produced by High Five Events, just like 3M Half Marathon. So you know you’re getting a top-notch event that focuses on participant safety and features an energetic finish line festival. And don’t worry, you won’t be the first Rookie to cross the finish line and you won’t be the last. Rookie Triathlon has seen thousands of Rookies begin their triathlon career! Pretty straightforward, triathlon is something different. Instead of logging hot and sweaty miles during the summer, knock out your swim in Barton Springs. Forget a long run with humidity, at least on a long bike ride you can generate your own wind to stay cool. You’ll meet new people, make friends, and possibly join a triathlon club, like Austin Triathlon Club. They’re an excellent resource for Rookie and Veteran triathletes. The one thing that isn’t all that different, you still have to train to cross the finish line! The 3M Half Marathon Expo & Packet Pick Up is just days away! The expo is a chance for participants to visit our sponsors and partners and check out what they have to offer. From on-course hydration to Official 3M Half Marathon Under Armour gear, below are the expo highlights you can’t miss! There are tons of prizes, giveaways, and discounts. Think of them like Pokemon, you have to visit them all! There will be several fun photo opportunities set up throughout the expo including our gif photo booth, a larger than life-size version of this year’s finisher medal, Course Maps and more. Be sure to visit them all. Visit the Austin Marathon (booth #27) to chat with their team about race day! Thinking about registering for the Austin Marathon, half marathon, 5K, or Manzano Mile? Register at their booth and take advantage of their expo deals. BONUS: take a picture in front of their Austin backdrop! Visit our friends at Fleet Feet Austin (booth #18) and snag your Official 3M Half Marathon Under Armour gear before it’s gone! Supplies are limited. They’ll also have hydration and nutrition for your last-minute needs. The Rookie Triathlon (booth #28) will have bean bag toss where you can win prizes. Rookie Triathlon is a sprint triathlon (300m swim, 11.2-mile bike, 2-mile run) that will take place on Sunday, May 5th. Make sure you check out their expo-only deals and make Rookie Tri the first triathlon of your life or the first triathlon of your 2019 season. Sample all of nuun hydration’s flavors at booth #33. Say hey and learn how you can win Texas-themed nuun bottles. BONUS: the first 5 people to show up to the nuun booth and complete the following for each day will win one bag of nuun performance. Airrosti Treatment Teams (booth #44) will offer complimentary injury assessments and taping to any participants suffering from pain or an injury. The assessments are 15-minute appointments. Ready to Run will have a photo booth contest at booth #13. They’ve designed a custom local Austin backdrop and custom photo props. Visit them, enter the contest, and learn how you can win a pair of Aftershokz Air Wireless Headphones or a $75 Ready to Run gift card. SPIbelt (booth #11) will have a spinning wheel out sporadically during the event where people can spin to win! Stop by, say hey, learn about their new products, and spin to see what you could win. Register at the Cap10K booth (booth #39) and receive a free Cap10K pop socket for your mobile device OR a free pair of Cap10K running socks. That’s a great deal for the largest 10K in Texas! Hilton will have a photo booth set up, raffle wheel, and giveaways at booth #51. Take a picture at their booth and post it online to spin the raffle wheel and win a prize. Visitors that are Honors members or download and enroll with their Honors app will have an opportunity for a second spin at the wheel. Prizes include tote bags, luggage tags, and chances to win a grand prize which includes hotel stays. Hang on the Heavenly Care Moving (booth #1) bar for 90 seconds and you’re entered into the drawing to win a bike! It’s that simple. The drawing will be held on Facebook Live on Monday, February 21st, at 6:00 p.m.
Everyone that lasts the full 90 seconds will be entered to win the city cruiser! 3M Half Marathon race week is here! It has finally arrived! 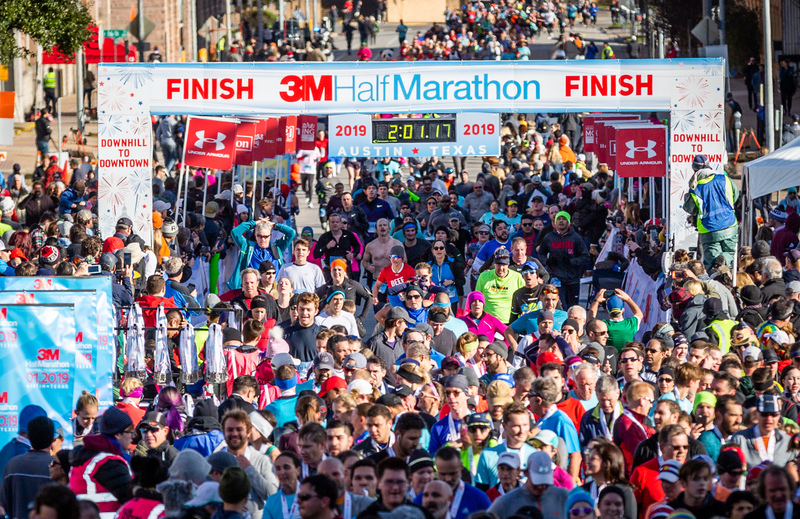 Race week for the 3M Half Marathon presented by Under Armour’s 25th anniversary is here! We know you’re just as excited as we are. With all the excitement is easy to forget the simple things you need to do race week. We’re here to help with these race-week reminders. Fact – running is best enjoyed with friends! They can run with you, cheer for you at various points along the course, or celebrate with you at the finish line festival. If your friends have been on the registration fence, now is the time. Tell them about the upcoming price increase on Thursday, Jan. 17th, or gift them a registration yourself! Begin hydrating during race week. It’ll help ensure your body has the fluids needed to secure that next PR! Make sure you’re getting a nice balance of electrolytes and fluids during the week. You’ve put in the training miles, now make sure all systems are ready for race day! BONUS – hydrate with nuun, it’s what’ll be on course. There aren’t many runners who don’t already do this, but nevertheless, it’s a great reminder. Layout everything you’ll need the night before and double-check it. This increases the likelihood that you forget nothing race morning. You should even plan what you’ll eat the morning of and the night before. Stick with what works! This should help keep you “regular” race morning. Last but definitely not least, celebrate! Once you cross the finish line, snag your commemorative 25th anniversary 3M Half Marathon finisher medal and head to the finish line festival. Grab your snack bag and some hydration. Then check out the food trucks, music, and the beer garden! BONUS – family or friends who cheered or tracked you via the app can meet you and help celebrate. The Taper. For those unfamiliar, tapering is referring to the reduced volume and intensity of workouts before race day. While some runners find it hard to scale back after so much time dedicated to training, others find themselves glued to their favorite couch. But doing too little or too much during this time period can compromise all your hard work. Make sure you are at the top of your game by following these tips between now and race day. This may be the best thing you can do for yourself at this time. Experts recommend sleeping eight to nine hours per night. To start, choose a consistent time that you are in bed, this may or may not include actual sleep. This will signal to your body that rest is important and hopefully lead to more shut-eye. If you have a favorite show that you just don’t want to miss, see if you can record it to watch after the race. It will be great to have something else to “marathon” after your race. Instead of focusing on trying to get a good night sleep the night before, try for two nights before. Pre-race jitters can sometimes leave us with the “I am not even sure if I slept at all” feeling the night before. But don’t let this bother you. 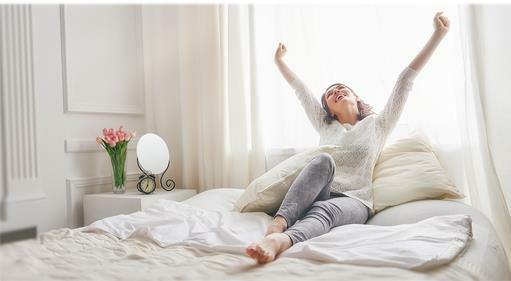 One poor night’s sleep shouldn’t affect your performance if you have tapered well in other aspects. While it might be out of our hands, setting yourself up with an easy week at work can have a big impact on your energy going into race day. So if there is a project that needs to be done put in the extra effort now or see if it can be completed after race day. Take time to find a quiet place to meditate for 10-15 in the morning or evening. Now is not the time to get a weird sore spot under your ribs because your friend convinced you to try the new barre class. Stick to what you know and focus on less intense and less volume for each workout. Keep your runs to under 30 minutes. It’s fine to do some easy cross-training on non-running days, as long as the activity doesn’t make your muscles sore or have the potential to cause injury. If you don’t want to exercise on days you don’t run, that’s okay, too. Skip the pizza and beer for now. Focus on a diet that balances moderate carbohydrates from whole food sources, quality protein, and healthy fat. You may also want to keep a close eye on your calorie intake. While you are used to high-intensity training and the extra food that comes with it, if you don’t watch what you eat, the pounds can sneak on in these last weeks, which is less than optimal for race day. Avoid eating that can affect your sleep quality. This includes eating large meals within 1.5 hours of going to bed as well as spicy foods or large amounts of protein. Now is also a good time to make sure you are well hydrated. It is recommended to drink 8-10 glasses of water a day. You can also add electrolytes from nuun, to get your body ready for race day hydration. You can also try the on-course fuel with Gatorade Endurance gels. By starting now, you are setting yourself up to be ready race morning. The last advice we have is to arrive at least 90 minutes before the start. 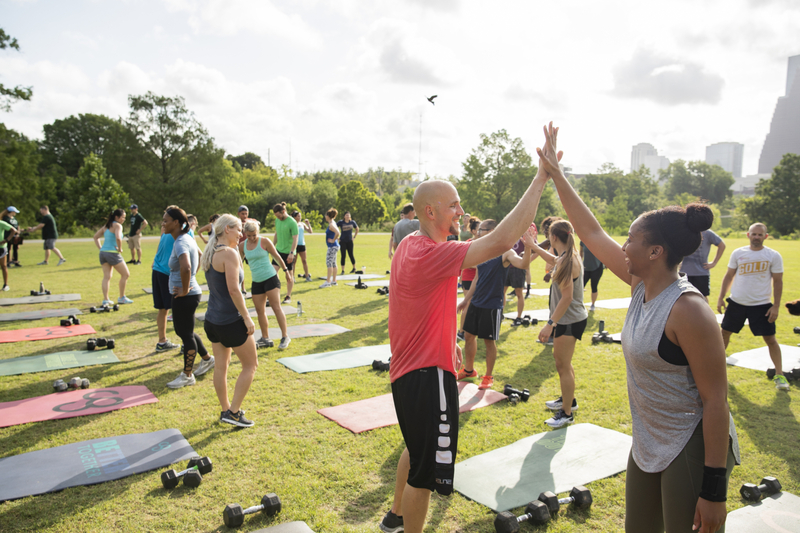 Walk around as a light warmup, and then follow the Camp Gladiator trainers as they lead a pre-race warm-up at 7:15 at the start line. Elite runners love the 3M Half Marathon course! It’s known for being one of the country’s faster half marathon courses. 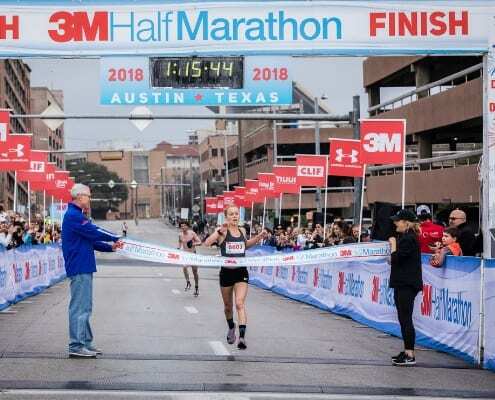 Elites run 3M Half Marathon presented by Under Armour to secure fast times, obtain PRs, try new hydration/nutrition plans, and/or prepare for the Austin Marathon or Austin Half Marathon. Come out and support these elites as they give their all on Sunday, Jan. 20th! Jessica returns to defend her 2018 3M Half Marathon title! She is the female champ and finished with a time of 1:15:45. She ran collegiately at The University of Texas from 2011-13. When she’s not traveling, you can find her running around Austin! Bryan is an accomplished runner who finished second overall at the 2018 3M Half Marathon (1:10:13). 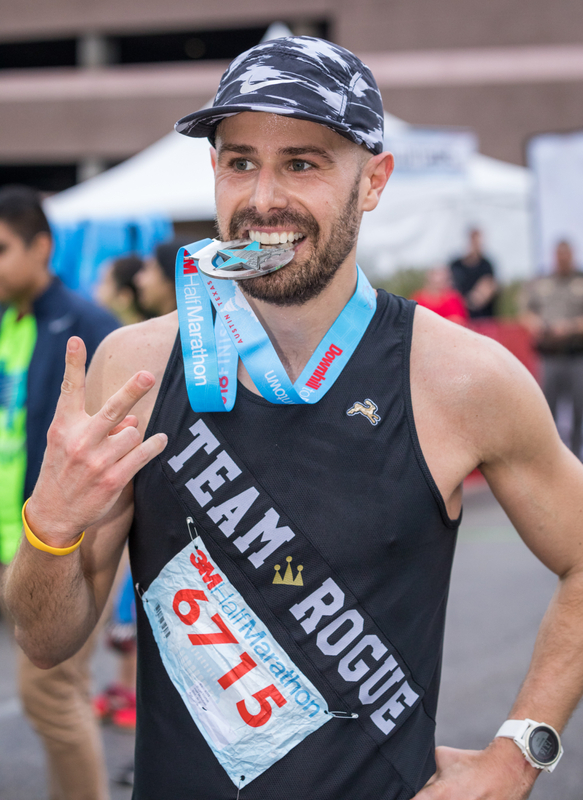 He is also part of a trio who will pace female elites to the Olympic Marathon Trials B Standard at the Ascension Seton Austin Marathon presented by Under Armour on Feb. 17th. Zach just moved to Austin from Wisconsin. He heard about 3M Half Marathon after reading about it in Runner’s World as being one of the best half marathons. Zach is a physical therapist at TexPTS and a father of two. He does a lot of his training pushing a double stroller with his 3- and 1-year-old (which they love). Zach most recently ran the 2017 Colorado Colfax Marathon in 2:32:34. He loves exploring the city of Austin through running and is very excited to get the grand tour during the 3M Half. Andrew is a born and raised Oklahoman who just can’t get enough wind! He competed in cross country and track at Southern Nazarene University. He earned various levels of recognition, from conference champion to All-American. A fun fact about Andrew is that when he was young his family were emu ranchers (yes the large dinosaur-like birds). His training started at a young age when these large, flightless birds would chase him. He now appreciates them! Sarah ran collegiately as an 800m runner and hung it up after 8 years of competitive running. After getting married and having 4 children in 3.5 years, she needed an outlet from the stress of daily life and to do something for herself. 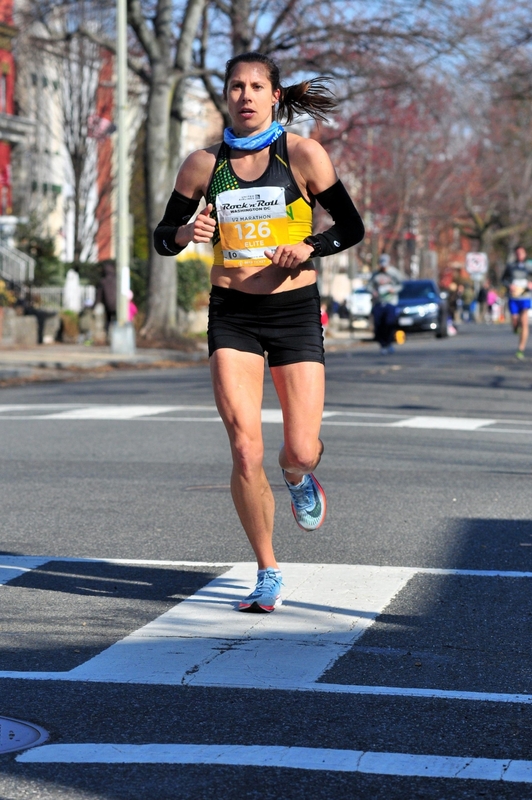 In 2014, she set a goal to break 1:30 in the half marathon. 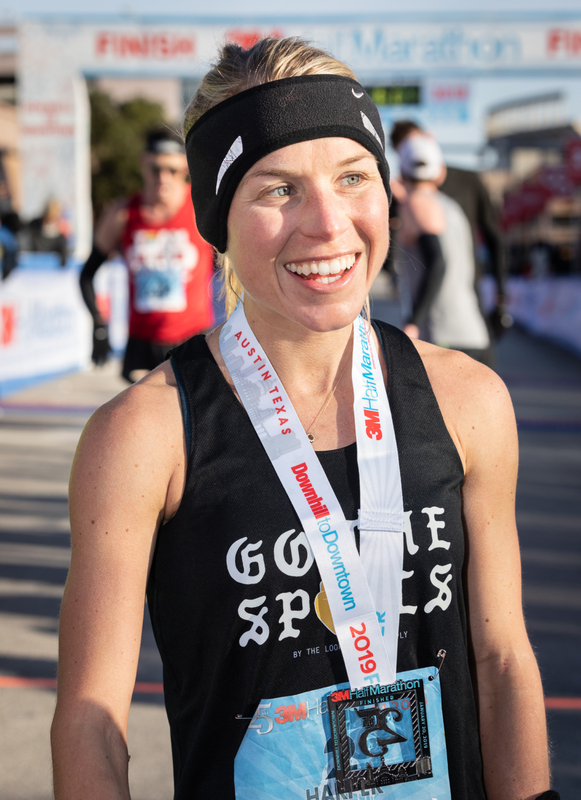 In the past 4 years, she has whittled down her PRs to 1:16:40 in the half marathon and 2:42:46 in the marathon, qualifying for the 2020 Olympic Marathon Trials. She won the 2017 Marine Corps Marathon (2:45:06) along the way. Michael has been running competitively since 2004 when he started running for Wills Point High School. After a successful high school career, he ran for Texas State University in 2008. While there, he set the school record in the steeplechase with a time of 9:02. After graduating, he started coaching at San Marcos High School. He is currently the head cross country and track coach. Goose is an alum of the University of Texas-Permian Basin where he competed in cross country and track. He also attended Texas A&M-Kingsville where he also competed in cross country and track. Goose is a Fleet Feet Austin employee who has a half marathon PR of 1:13:02. He lives in San Marcos, Texas, with his girlfriend and dog Domino. Goose and his girlfriend will soon welcome their newborn daughter. Natasha is a transplant from South Africa, a mom to a 2-year-old daughter, and has been racing as a professional triathlete since 2010. 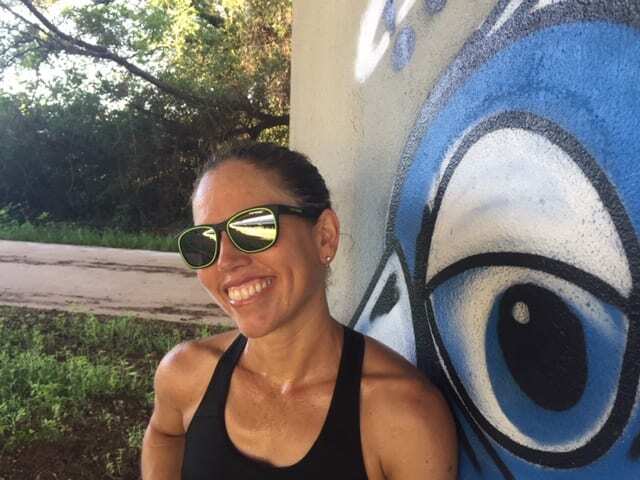 Her racing success includes multiple victories at Austin’s local triathlon championship race – the Rookie Tri, a win at Lifetime’s Cap Tex Tri event in 2018, and multiple top-10 finishes at Ironman and 70.3 events over the last 10 years. She is also the 2017 Decker Challenge half marathon female champ (1:26:27).